Lasers are used for a broad range of purposes, including laser printing, entertainment, and surgery. The use of lasers expands even into dentistry; one specific type of laser, known as a photo biomodulation (PBM) laser or cold laser in Weatherford, has several useful applications. Indeed, it may be able to make your next visit to our office more comfortable and efficient than ever. A cold laser is a special type of non-thermogenic light source that stimulates a number of physiological responses within the body. The processes it incites can reduce pain and inflammation and encourage hard and soft tissue regeneration. PBM or cold laser therapy (also sometimes called low level laser therapy) is often used in chiropractic, massage, and physical therapy. Veterinarians may also use it to help their patients, including injured horses! Hundreds of studies have been performed on the use of cold lasers in medicine, and they have consistently found that the therapy is safe. It produces no significant side effects because it only stimulates cells that stand to benefit from the light’s healing properties. Relieve facial pain. Patients with TMJ problems may find that the cold laser eases their discomfort. Used along with other therapies, the laser can promote the TMJ’s long-term well-being. 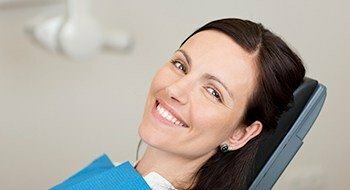 Reduce pain after certain dental treatments. Whether your mouth is sore because it was open for a long time, or you are experiencing discomfort for other reasons, the laser may be able to help you get back to feeling your best as quickly as possible. Encourage healing after implant placement and tooth extractions. The laser may help to prevent dry socket after tooth extractions. It can also promote the osseointegration process (the process of a dental implant bonding with the bone around it) and reduce postoperative discomfort. Fight nausea and gagging. When the laser is applied to a specific pressure point in the wrist, it can calm down the gag reflex when our team is taking X-rays and impressions. Anesthetize baby teeth. 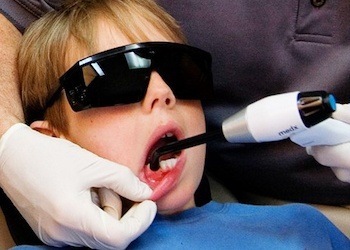 The laser can numb a child’s baby teeth without the need for injections; it does so by stimulating endorphin production and inhibiting pain signals. Would you like to learn more about our cold laser and how it may benefit you? Contact our office today to ask questions about this remarkable technology or to schedule your next appointment.